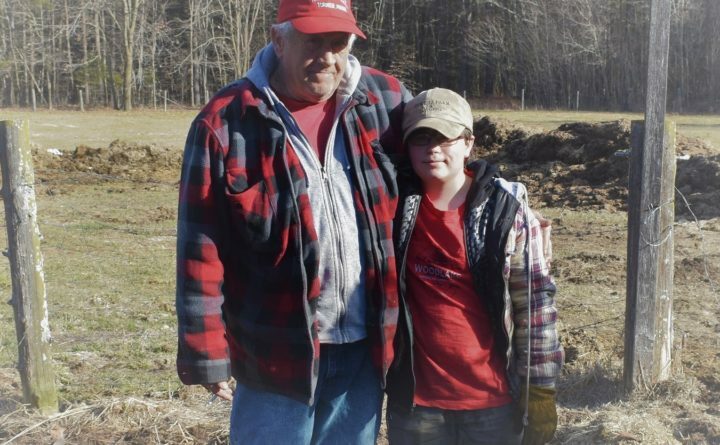 Hewett grew up on a dairy farm and has been running his own diversified farm in Skowhegan for 30 years, producing and selling hay, corn, cattle, compost, maple syrup and wood. He is constantly re-defining his farming operation, with an eye to adding diversity and improving sustainability on his farm. Hewett was the first to sign up in 2014 for a Somerset SWCD project with USDA-Natural Resources Conservation Service (NRCS) providing financial and technical assistance to landowners to add cover crops and reduce tillage on their farms. After that initial project, he continued to focus on soil health on his farm, experimenting with his cover cropping, no till and crop rotation strategies. He also manages his woodland and will be doing a crop tree release for improved forest stand health. In 2018, Hewett became a first-time participant in the Somerset SWCD’s Ag Allies grassland bird project. The program works with farmers managing fields with high grassland bird populations, such as bobolinks, where hay harvest can be delayed until after the young have fledged in early July. He enrolled a 30-acre field in the program, allowing large groups of bobolinks as well as savannah sparrows to be successfully reared in the field. The Outstanding Farmer and Outstanding Woodland Owner awards will be presented at the Somerset County SWCD annual dinner at 6 p.m. Thursday, April 25, at the Canaan Farmers Hall. Maine Department of Agriculture, Conservation and Forestry Commissioner Amanda Beal is scheduled to speak at the event, which also includes a locally sourced dinner prepared by Radici Cucina of Skowhegan. Seating is limited and tickets must be purchased by April 18 at the SWCD office located at 70 East Madison Road in Skowhegan. A ticket mail order form is available online at www.SomersetSWCD.org. For more information, phone 207-474-8323 x 3 or email somersetswcd.outreach@gmail.com.